Hey, kids! Time to put that iPhone (or iPod Touch!) 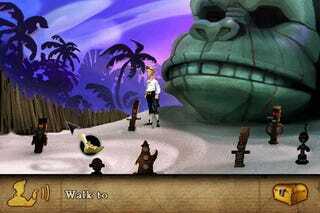 to good use, as Lucasarts have just released the rather excellent The Secret of Monkey Island: Special edition for Apple's handhelds. As you can see, in visual terms it's not a bad downgrade of the gorgeous PC/360 version. As far as gameplay goes...I haven't played it (come on, I only just finished the PC version! ), but it looks fairly straight-forward: finger moves cursor, and the buttons down the button handle interaction and inventory. If you're interested, it'll cost you $8.